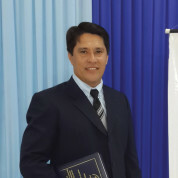 Felix is a teacher at three different secondary schools in Paraguay. One of them is a technical and agricultural school in an impoverished rural zone in the Greater Asunción area. Agriculture and livestock are important aspects of its economy and they are currently at risk when it comes to sustainability. Felix aims to turn this school into a model centre for environmental education that promotes good agricultural practices, integrates the concept of value chains, and teaches sustainable production and waste management. He connects his students with the industrial agricultural environment through internships and trips to research sites, and prepares them for the workplace by teaching them the necessary social skills and abilities. Under his supervision the school has built two model nurseries and installed a solid organic waste processing plant where the municipality of Luque can bring organic waste, both from individual homes and the town dump, to be converted into soil. In response to high unemployment and migration to the cities, Felix has initiated teaching students the business skills required for establishing and running their own family enterprises, focussed on growing and producing organic food in the local green belt. In addition to learning about finance and negotiation tactics, his students gather hands-on experience by raising animals and farming a plot of land. In this class they make their own decisions and can even take home everything they produce. Join the #TeachersMatter movement by sharing Felix Gimenez’ update.